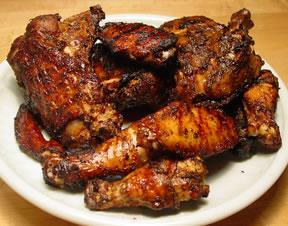 A simple jerk chicken recipe. Seasoning the meat in advance to get a shorter cook time on preparation day is recommended. This is one jerk recipe that cannot go wrong. So go ahead and fire-up the grill!!! In a food processor or blender, combine the green onions, onion, jalapeno pepper, CPC Mushroom Soy Sauce, vinegar, vegetable oil, brown sugar and JCS Dry Thyme. Mix for about 15 seconds. Place the chicken in a medium bowl, season with JCS Chicken Seasoning, jerk seasoning, and JCS Garlic Escallion & Allspice, then coat with the marinade. Refrigerate for 4 to 6 hours, or overnight. Preheat grill for high heat. Lightly oil grill grate. Cook chicken on the prepared grill 6 to 8 minutes, until fully cooked.